In yesterday’s post I introduced the St. Paul’s Watch. In today’s post I will focus on the night of the 29th December 1940. 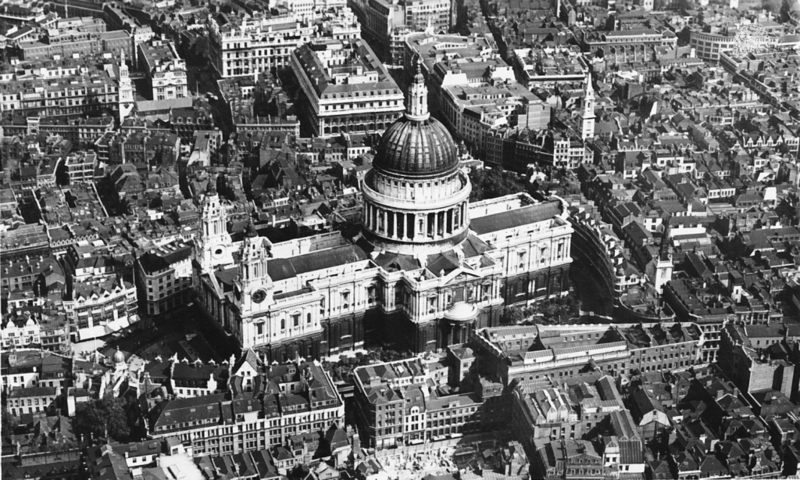 Although there had been many bombing raids on London since mid 1940, the first raid where the survival of St. Paul’s Cathedral was at risk and where the Watch were tested in the extreme was on Sunday 29th December 1940. Before getting into detail, an overview of the area around St. Paul’s Cathedral will help set the scene. The following photo shows St. Paul’s and immediate surroundings just before the war. The Cathedral was surrounded on all sides by narrow city streets, closely packed buildings typically of up to six floors in height. St. Paul’s Cathedral was still the dominant building standing high above the surroundings. To the north was Paternoster Square and Paternoster Row. Historic streets that were one of the centres of the publishing industry with many thousands of books stored in these buildings. To the north-west is the tower of Christchurch Greyfriars, to the north-east is the tower of St. Verdast alias Foster on Foster Lane and immediately to the south-east of the Cathedral is the square tower of St. Augustine, Watling Street. To the south, the land dropped down to the River Thames with the extensive warehousing that was still a feature of the City river banks. The German raid planned for the night of the 29th December was to feature an initial attack led by a specialist Pathfinder Squadron, followed by the first wave of bombers with mainly incendiary bombs and some high explosive to set the City alight, followed much later in the evening by the second wave of bombers with high explosive bombs. The clear intention was to destroy the City with key strategic targets being the bridges over the river, train stations and tracks and communications centres such as the Faraday building on Queen Victoria Street which was a centre for the London Telephony system and also for international telephony circuits. The role of the Pathfinder squadron was to locate the target using a beam radio system where radio signals transmitted from the Continent would direct a plane to its target with a change in signal where beams crossed indicating a key geographic point to commence the attack. The planes of the Pathfinder Squadron flew over the countryside between the coast and south London and on approaching Mitcham the signal changed indicating the point from where a carefully planned course and time would lead the planes directly to the centre of London. This approach allowed for accurate bombing despite the heavy layers of cloud below. The aim of the Pathfinders was to start fires which the main bomber force could then follow. 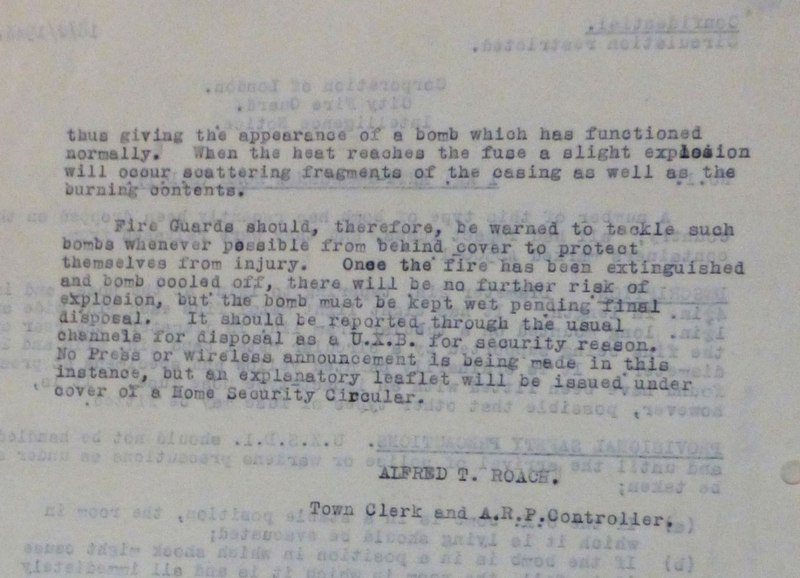 At the planned time the bombers released canisters containing the incendiary bombs. On the drop down, the canisters then broke open to shower individual bombs over a wide radius. The waves of the main bomber force then started to arrive, each loaded with canisters of incendiary bombs and the occasional high explosive bomb. The following photo from the IWM collection (© IWM (MUN 3291)) show the 1KG incendiary Bomb that was dropped in such large numbers on the night of the 29th December. These were relatively small devices and could be easy to deal with, however when dropped in such large numbers, it only took a few to start fires in hard to reach locations that could very quickly get out of control. 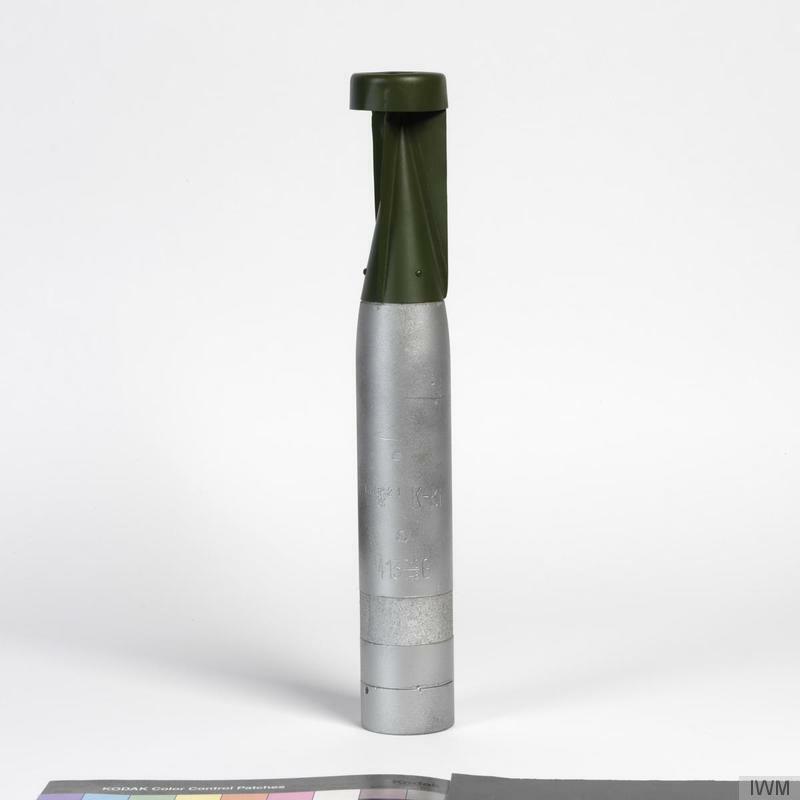 The 1KG incendiary was 34.5cm long and 5cm in diameter. The body was of magnesium alloy with a filling of an incendiary compound (thermite). On hitting the ground, a needle was driven into a percussion cap which ignited the thermite. The heat from this also ignited the magnesium casing causing an intense heat which would ignite any flammable material that the bomb was in contact with. 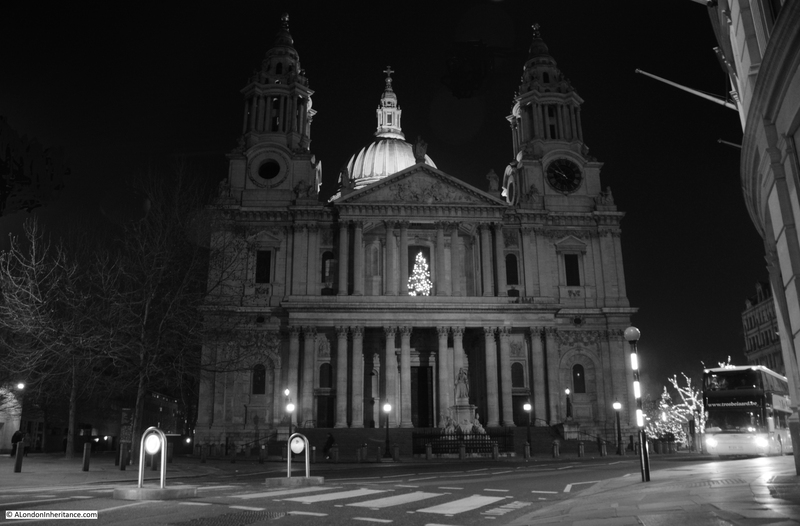 For the St. Paul’s Watch, the first indication of the danger to the Cathedral came soon after 6pm when they heard a sound described as “a scuttle full of coals being spilled on the floor” which was the sound of incendiary bombs landing all around the Cathedral. 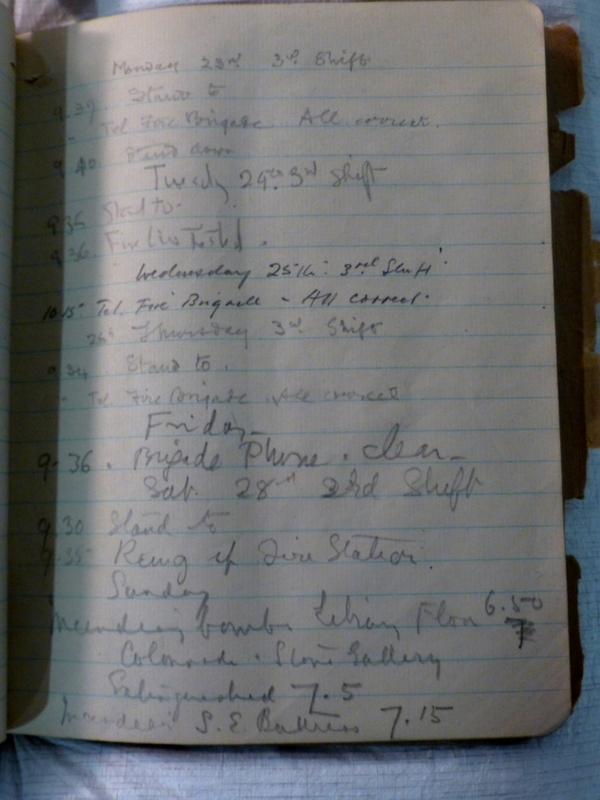 In the crypt headquarters for the Watch, a log was kept throughout the war recording individual events as they happened. Incidents being recorded in a very “matter of fact” way, logging the time and the incident. 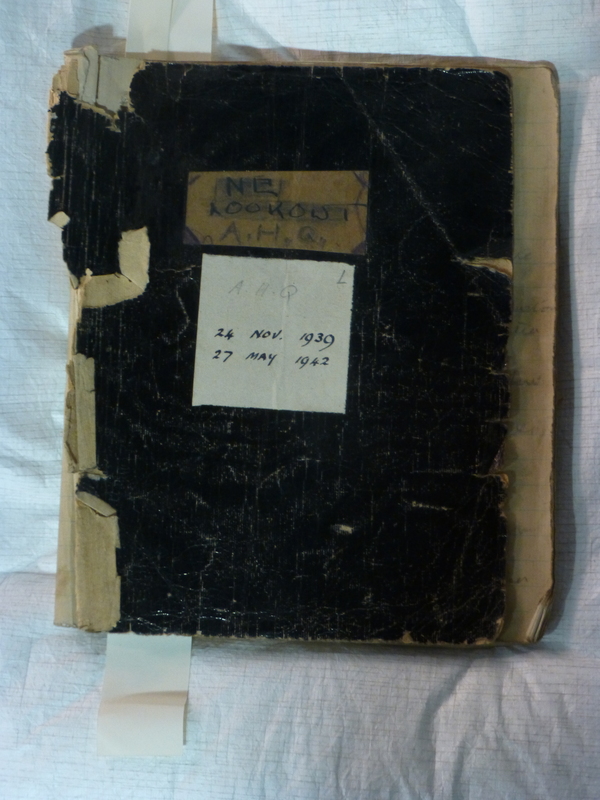 The log is still held in the St. Paul’s Archives, the delicate state reflecting the years and conditions of use through the war. I took the following photo of the log covering the 29th December 1940, now in such a delicate state that it needs to be treated almost like a medieval manuscript. 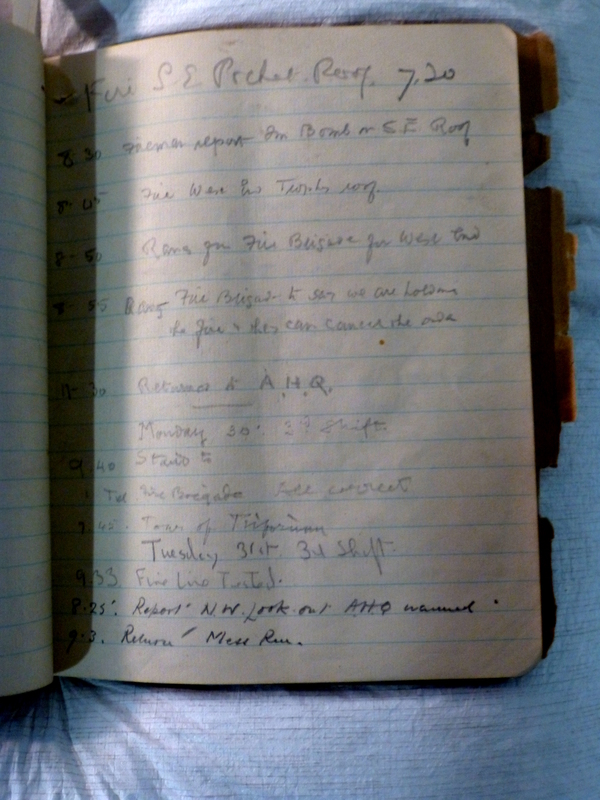 The first page shows a quiet run up to Sunday the 29th, the routine call to the Fire Station the main recorded event. The “stand to” was then recorded the following Monday morning at 9:40 after what must have been a most exhausting night. The log does not really do justice to the fight that the Watch had on their hands that night. I suspect that there were too many events and they were too busy to phone through details. The book “St. Paul’s Cathedral In Wartime” by W.R. Matthews, the Dean of St. Paul’s during the war and who was in the Cathedral on the night of the 29th provides a more detailed account. Adding to the number and location of fires, the Watch now faced a further problem, the availability of mains water. That evening, three, thirty-six inch and twelve other large mains were damaged and when water was most needed there was a very low tide on the River Thames. Hoses and pumps pulling water from the river became clogged with mud and the use of Fire Boats became impossible. By 8 p.m. there were some three hundred pumps at work in and around the City, trying to pull water from whatever source was available, the number of pumps also having the effect of reducing the overall pressure. The effect on the Cathedral was the failure of all external supplies of water. The Watch was now down to the supplies of water that had been stored in whatever container could be found or used in the days of preparation. 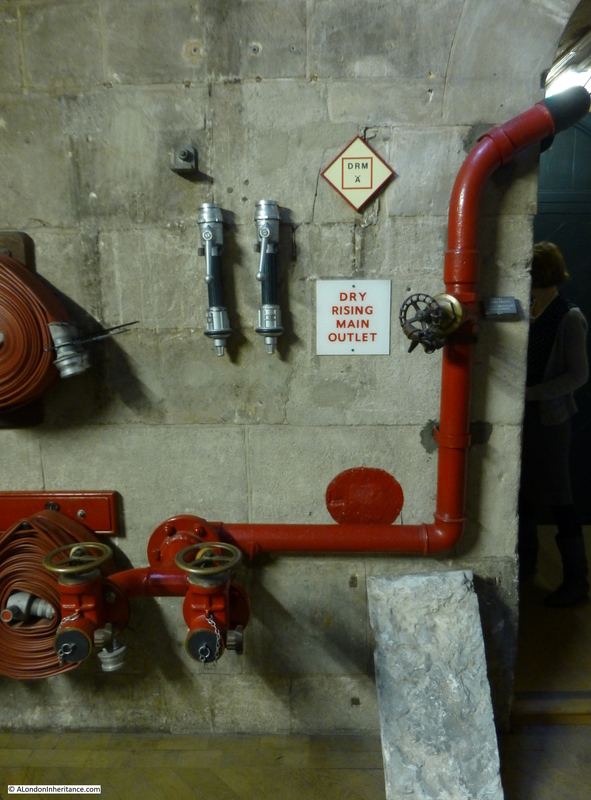 Planning that proved extremely fortunate as these kept up supplies to the stirrup pumps which proved the key tool in getting to incendiary bombs and fires in extremely difficult places across the roofs of the Cathedral. Stirrup pumps and sand bags now became the only tools available in the defence of the Cathedral. The conditions on the roofs for the Watch must have been extreme. The following photo (©Mirrorpix) was taken from the Cathedral on the evening of the 29th December looking over towards Paternoster Square. The Chapter House can be seen in flames with the roof lost in the lower part of the photo, just to the left of the statue. See my earlier post which can be found here showing the same scene taken by my father after the war, along with my 2014 equivalent. The benefit of all the previous evenings of preparation, training and exercise and the work of Godfrey Allen in preparing the Watch and the defences of the Cathedral were now clearly evident in the way the members of the Watch went to work. The Dome was always considered a very vulnerable part of the Cathedral. Not only was the Dome one of the defining features of the Cathedral, it was also at a very high risk from fire. Wren’s design for the Dome was ingenious. Along with the Dome, there is the Lantern structure at the top of the Dome. the Dome alone could not support the weight of the Lantern, therefore Wren constructed three domes. There is the interior Dome, visible from the floor of the Cathedral. Above this there is a second Dome, actually a brick cone structure reaching up to the Lantern and supporting the weight of the Lantern. The third, exterior dome that we see from outside the Cathedral is constructed around this cone, with a wooden structure supporting the lead on the exterior of the Dome and supporting the weight of the Dome by wooden beams and joists resting onto the cone and the floor. Any penetration of the Dome by an incendiary would gain access to this wooden structure which could quickly develop into a fire that would engulf the Dome. Whilst the Watch was busy fighting the fires across the roof, the Cathedral received a call from Cannon Street Fire Station to say that the Dome was on fire. A team was dispatched to deal with this new threat and found that whilst the Dome was not actually on fire, an incendiary bomb had not fully penetrated the Dome and was lodged half way through the lead roof, which was beginning to melt. Watch teams were allocated to patrol the Dome, but fighting fires in this area was difficult with Watch members having to balance along beams of wood to get to a fire, carrying a stirrup pump and bucket of water. The bomb eventually fell out of the Dome and onto the Stone Gallery where it was quickly dealt with. The molten lead presumably not providing enough support and the weight distributed in such as way that it fell outwards rather than in. The survival of the Cathedral was critical for many reasons. In 1940, America had not yet entered the war and there were factions that assumed that the UK was a lost cause and could not withstand the German onslaught. When the Dome was hit, American reporters were already sending cables to their newspapers in the US that St. Paul’s had been lost. The ability of London and the country as a whole to survive the blitz was critical in demonstrating to the US that the UK would withstand the attack and act as a base for any future attack on the occupied continent. This photo was taken at night, with no artificial lighting. The scene is lit by the fires burning around St. Paul’s. It was claimed to be as bright as day. The vehicles lined up along the road are those of the fire crews working on the surrounding buildings. To the right can be seen fires in buildings between the Cathedral and the River and to the left can be seen the glow of fires from Paternoster Row and down towards Cheapside. A much calmer scene with only the stopping of tourist buses providing any activity. Just to the left of where this photo was taken is Ave Maria Lane, a short road that leads from Ludgate Hill to Amen Court. On the 29th December 1940 this lane was ablaze with fire crews working in pairs trying to stop the spread of the fires (photo ©Mirrorpix). Two men and a hose trying to control a long stretch of burning buildings, with the constant threat of explosions, bombing and the structural failure of the burning buildings causing a catastrophic collapse into the street. Another perspective of the area around St. Paul’s on that evening can be found in the memoirs of the wonderfully named Commander Sir Aylmer Firebrace, Chief of the Fire Staff and Inspector-in-Chief of the Fire Services. On the evening of the 29th December he was working through London to see what needed to be done and what support was required. He started travelling by car from Southwark where serious fires were developing. Across the river he had to abandon the car and worked through the city, walking from Cannon Street to the Redcross Street Fire Station just to the north of St. Paul’s. Redcross Street is one of those lost under the Barbican development. Fore Street used to extend to St. Giles Cripplegate from where Redcross Street ran roughly north to Golden Lane which still remains. Stand on the north side of St. Giles and look slightly west of north across the water and that is the routing of Redcross Street and the location of the Fire Station is directly in front of you. “In the control room a conference is being held by senior London Fire Brigade (LFB) officers. How black – or, more realistically, how red – is the situation, only those who have recently been in the open realise. One by one the telephone lines fail; the heat from the fires penetrates to the control room and the atmosphere is stifling. 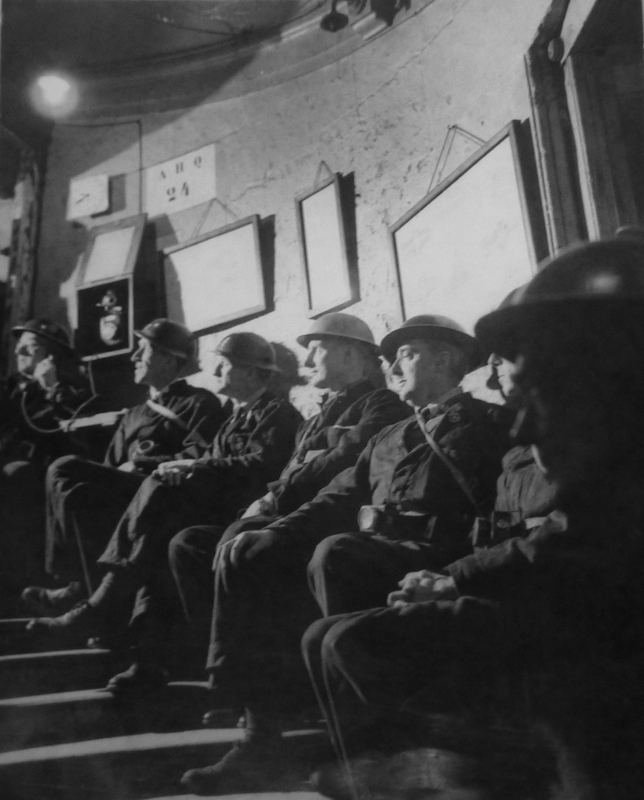 earlier in the evening, after a bomb falls near, the station lights fail – a few shaded electric hand lamps now supply bright pin-point lights in sharp contrast to a few oil lamps and some perspiring candles. The firewomen on duty show no sign of alarm, though they must know, from the messages passing, as well as from the anxious tones of the officers, that the situation is approaching the desperate. A women fire officer arrives; she had been forced to evacuate the sub-station to which she was attached, the heat having caused its asphalt yard to burst into flames. It is quite obvious that it cannot be long before Reccross Street Fire Station, nearly surrounded by fire will have to be abandoned. The high wind which accompanies conflagrations is now stronger than ever, and the air is filled with a fierce driving rain of red-hot sparks and burning brands. The clouds overhead are a rose-pink from the reflected glow of the fires, and fortunately it is bright enough to pick our way eastward down Fore Street. Here fires are blazing on both sides of the road; burnt-out and abandoned fire appliances lie smouldering in the roadway, their rubber tyres completely melted. the rubble from collapsed buildings lying three and four feet deep makes progress difficult in the extreme. Scrambling and jumping, we use the bigger bits of masonry as stepping stones, and eventually reach the outskirts of the stricken area. A few minutes later L.F.B. officers wisely evacuate Redcross Street Fire Station, and now the only way of escape for the staff and for the few pump crews remaining in the area lies through Whitecross Street (also now lost under the Barbican development)”. Quite remarkable to stand outside St. Giles Cripplegate and consider these events happened here 74 years ago, and that this area is so close to St. Paul’s Cathedral, which had it not been for the Watch would almost certainly have suffered the same fate and been severely damaged if not destroyed by fire. One of the frustrations for the St. Paul’s Watch and also for many members of the Fire Services was that so much could have been saved if many of the buildings also had a Watch, or were open for access. From their vantage point on the Cathedral, members of the Watch saw many instances where an incendiary landed on the roof of a building and smouldered before the heat caused a fire to take hold. 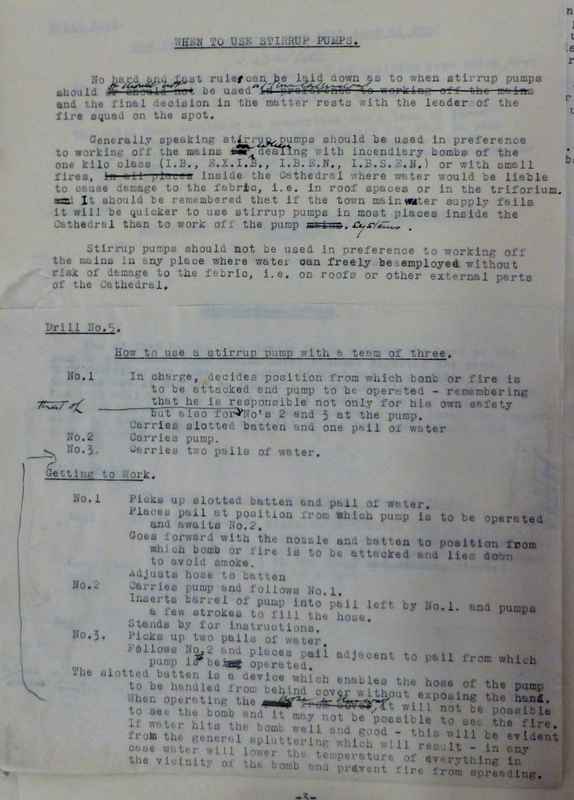 Immediately after landing, an incendiary bomb was relatively easy to do with, sandbags, a stirrup pump and a small supply of water were sufficient, however after a while when the magnesium coating had ignited, temperatures reached very high levels and anything flammable within range of the bomb would catch fire and spread very quickly. Had other buildings employed teams to watch over the roofs, many fires could have been extinguished quickly. As it was the weekend, many buildings were also locked and secured so whilst a bomb may be visible on the roof, gaining access was a challenge. The lack of water also prevented fires being extinguished. The St. Paul’s Chapter House could have been saved when hit by an incendiary if there had been six buckets of water immediately available. Late in the evening, although the City was ablaze and the Watch keeping a careful watch on the possibility of burning embers spreading the fire to the roof of St. Paul’s the All Clear was surrounded. German plans had been for further waves of bombers after the first waves with incendiaries, to then attack with high explosive bombs which would have ripped the city apart, have been a very severe risk to those trying to control the fires and to the equipment used to fight the fires. The weather over France had been getting worse, the grass runways were being turned into mud and late in the evening the command was given to cancel the waves of bombers with high explosive bombs. The tide also turned in the Thames and the returning water provided much-needed resources for the considerable numbers of pumps now fighting the fires throughout the rest of the night. After a long night, the situation was bought under control by 8 a.m. on the morning of the 30th, however many fires continued to burn, but did not spread. After the All Clear had been sounded, Londoners were amazed to see that St. Paul’s Cathedral was still standing. The billowing smoke and colour created by the fires resulted in the strange visual effect of the Dome of the Cathedral appearing to float on a glowing sea of cloud, with the colours changing as the wind blew in different directions. An estimated 24,000 incendiary bombs fell on London that evening. The potential impact of each bomb being amplified by the damage that a single out of control fire could cause, given strength by the wind that blew across the City. 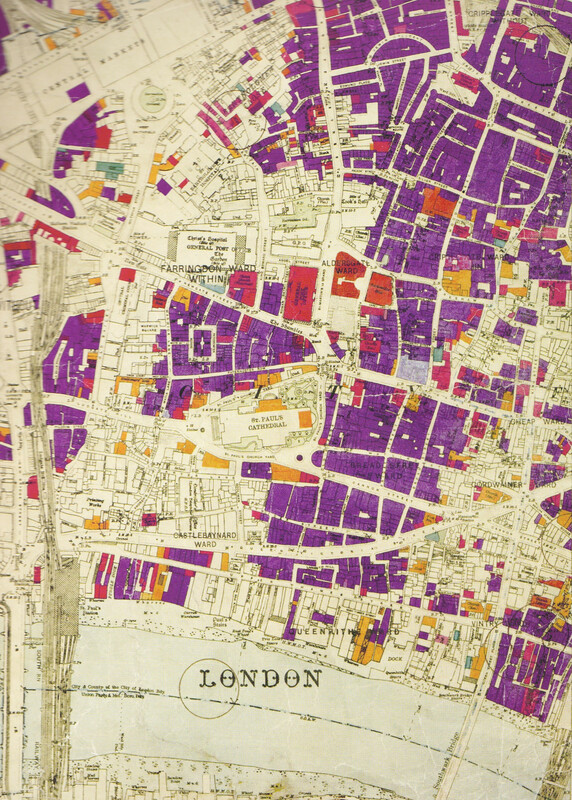 To give an idea of the devastation, the following extract from the London County Council Bomb Damage Maps (source: the London Metropolitan Archives) illustrates the bomb damage around St. Paul’s. (Purple is damaged beyond repair). Whilst this covers the period 1939 to 1945, much of this damage was on the night of the 29th December 1940. The scenes that welcomed workers returning to the City on the Monday morning were of devastation. Fires still burning and the streets covered in debris and with fire fighting equipment. The following photo was taken on the morning of Monday 30th December and shows Ludgate Circus and the road up to St. Paul’s. The results of the night’s work still clearly visible. To walk around the Cathedral, late in the evening of the 29th December 2014, the contrast with that night 74 years ago was very apparent. 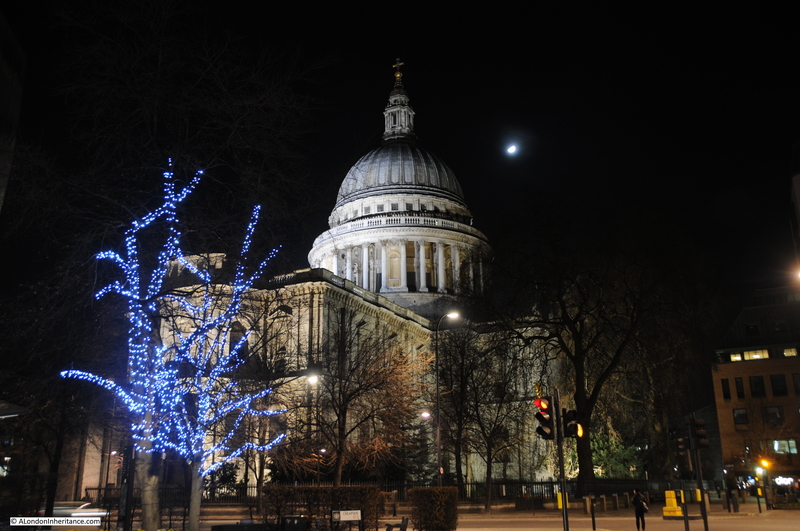 The streets were quiet, Christmas decorations added light to the scene and the Cathedral was lit up, not by fire but by spotlights which nightly turn the Cathedral into one of the most dramatic and beautiful landmarks of the City. The incendiary that lodged in the Dome, must have been in the area of the Dome shown in the above photo. It was reported by the Fire Station at Cannon Street so would have been in this segment. 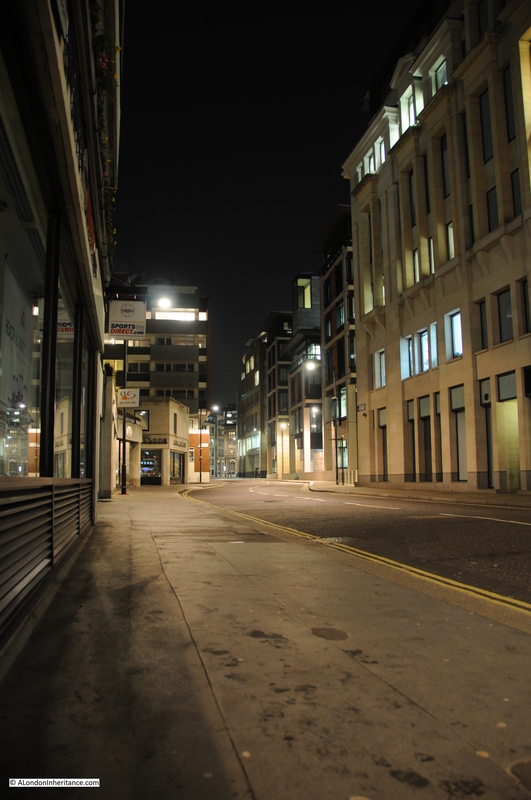 Towards Cheapside, another difference between the two nights is apparent. 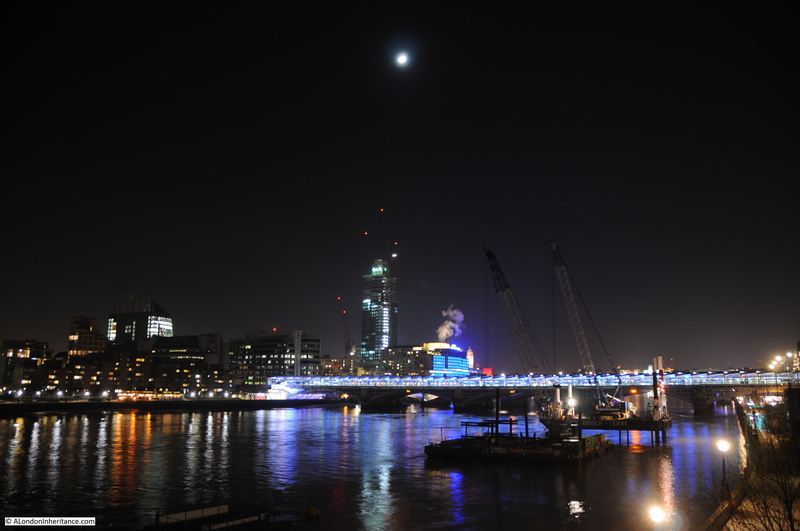 In 2014, the night was clear with a moon shining across the City. 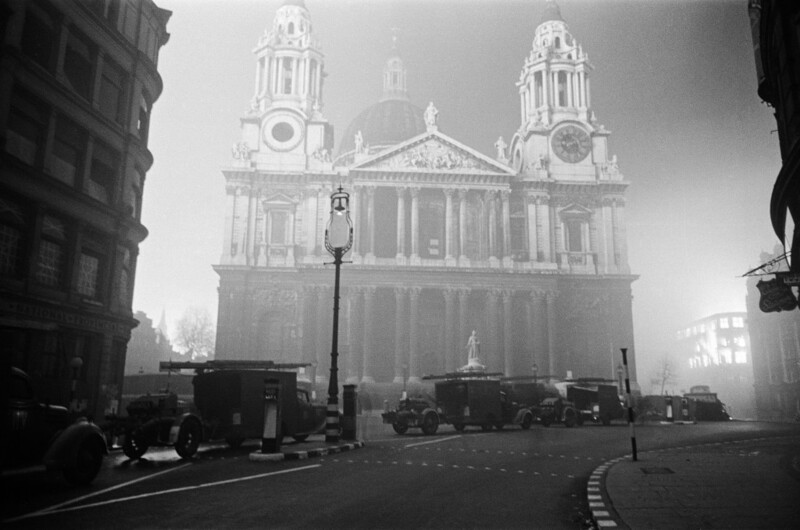 Had the weather been like this 74 years ago, the later waves of bombers carrying high explosive would have been able to take off and the outcome for St. Paul’s, the City and the Fire Fighters would have been very different. And down on the Thames, the tide was high in 2014 and had this been 1940 would have been able to supply the water needed for the hundreds of pumps across the City and for the riser water system of St. Paul’s Cathedral, along with the Fire Boats that would have attacked the fires in buildings along the water front..
That rounds off my two posts covering the St. Paul’s Watch and the raids on the night of the 29th December 1940. I hope this has done justice to the work of the Watch during this single day, and during the war, as well as the London Fire Brigade who worked tirelessly throughout that night, and through the war. It has been fascinating to research and learn and I have only scratched the surface on this subject. I recommend the excellent books in the sources section below for further reading. 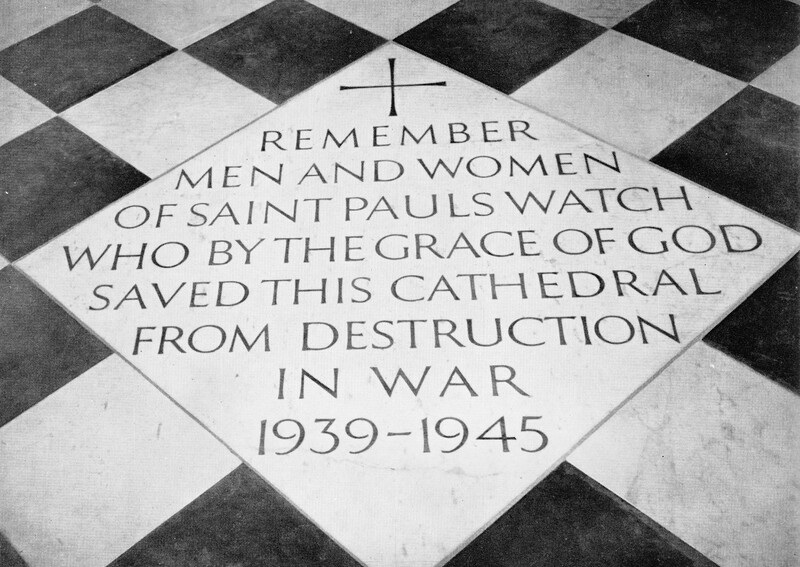 This entry was posted in The Bombed City and tagged London Blitz, St. Paul's Cathedral, St. Paul's Watch on January 4, 2015 by admin. In August of last year, I was standing on the Stone Gallery of St. Paul’s Cathedral on a beautiful sunny day with London looking fantastic in all directions. I had my iPad with me which contained photos my father had taken from the same place just after the war, showing a very different London. I covered these photos in two posts which can be found here and here. Looking at the devastation caused by wartime bombing, it was remarkable that St. Paul’s survived relatively unscathed. How had this happened, and what would it have been like to have experienced such a dramatic event in London’s history? I wanted to find out more, and I have written two posts consolidating the results of some research carried out since that August day. I decided to pick one day’s events to provide some focus. 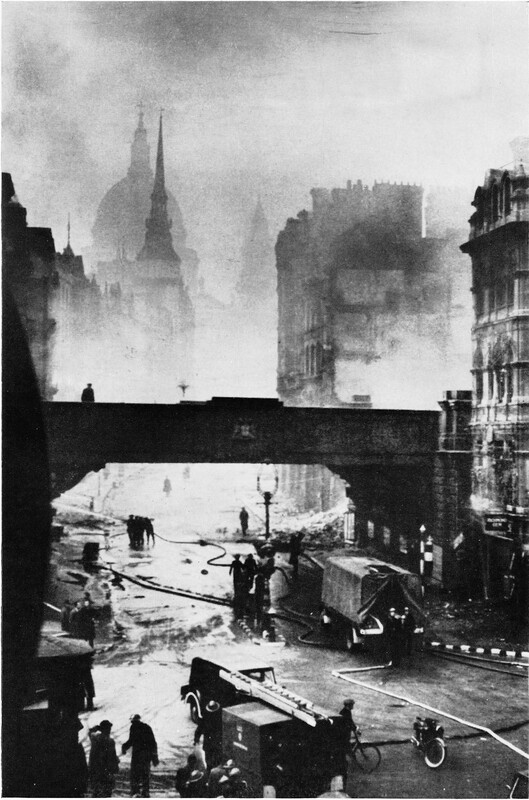 The bombing on the 29th December 1940 caused fires of such intensity and scale that it became known as the 2nd Great Fire of London and from a distance it appeared that St. Paul’s would be lost. I have split this across two posts which I will publish over two days on the 3rd and 4th of January 2015. 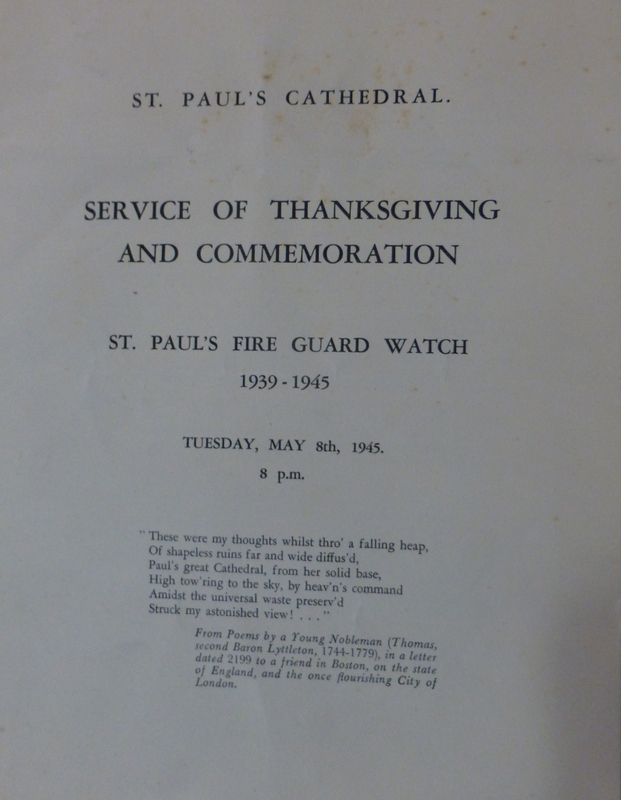 This post covers the St. Paul’s Watch, the volunteers who protected the Cathedral during the war. 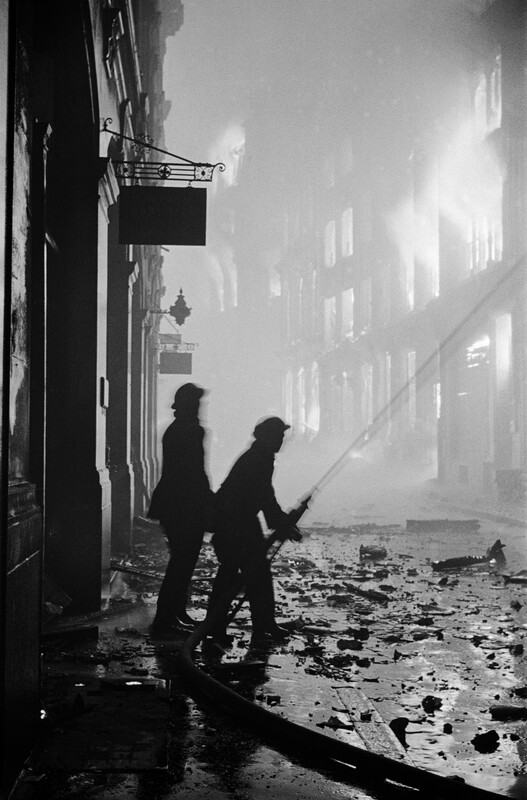 The second will cover the night of the 29th December 1940, the 2nd Great Fire of London. My apologies for the length, however I hope you will find these two posts as interesting to read as I did to research. (Unless otherwise stated, in this post, all photos and documents are from the St. Paul’s Cathedral Architectural Archive). 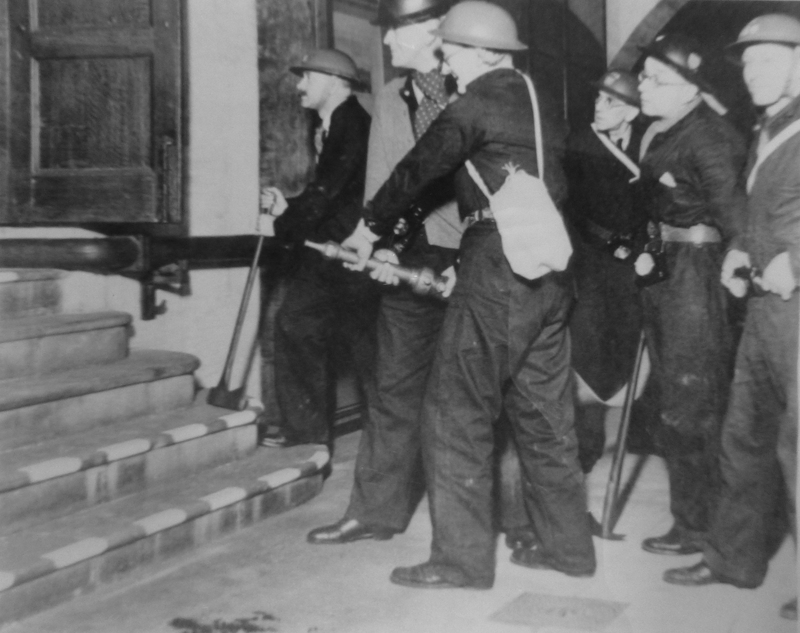 In the months leading up to the start of the 2nd World War, there was much preparation in London for what was expected to be a devastating war from the air. Limited bombing during the 1st World War had shown the possibilities, further developed in the Spanish Civil War and then by the Blitzkrieg or lightning form of mechanised warfare used by Germany in the attack on Poland which was the catalyst for bringing the UK into formal war with Germany. 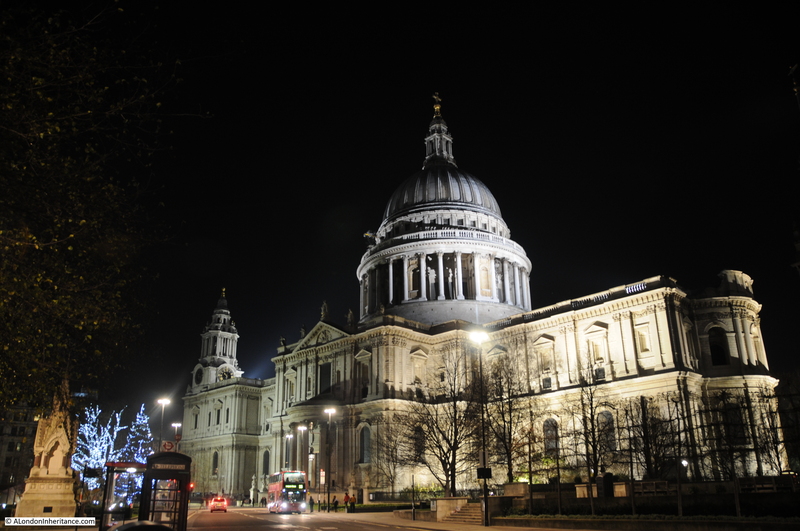 St. Paul’s Cathedral was considered at high risk from aerial bombing. Unlike today, the Cathedral was by far the tallest building in London, standing clear on one of the two hills that formed the original City. Not only was the Cathedral an architectural masterpiece created by Wren, one of London’s main architects after the Great Fire, it was a central landmark in the life of Londoners and to the nation. In the month’s leading up to the start of the war, the Cathedral started to prepare. On Saturday, 29th April 1939 one of the regular meetings of the Chapter of St. Paul’s was held, and although a regular meeting, this day’s session was different, it was to start planning for how the Cathedral could be protected. During the 1st World War, a volunteer watch had been kept at the Cathedral and it was along these lines that planning for the new threat was made, with the creation of a volunteer Watch who would have responsibility for defending the Cathedral against any form of aerial attack. Mr Godfrey Allen, the Cathedral Surveyor was appointed to command the Watch and preparations were made to put the Cathedral onto a war footing. One of the first challenges was to find sufficient manpower to mount a fulltime, day and night watch over the Cathedral. This was at a time when the majority of the able-bodied, younger male population was expected to be involved within the armed forces. The Cathedral Watch initially started with 62 volunteers from the Cathedral staff, however this number was not sufficient to maintain a full 24 hour Watch over the Cathedral and many of these volunteers were also approaching retirement and when action was needed across the heights of the Cathedral, in the roof spaces, under the Dome etc. additional support was needed. At the suggestion of Mr Godfrey Allen, a request by the Dean was made to the Royal institute of British Architects (RIBA) for volunteers to join the Watch. RIBA was a perfect match with members having knowledge of architecturally complex buildings and therefore perfectly suited to working in a building such as St. Paul’s and the age profile of experienced architects probably made a larger pool of people available. I would have thought that being given the freedom of the Cathedral would have been a considerable incentive for anyone interested in the architecture and history of the building. 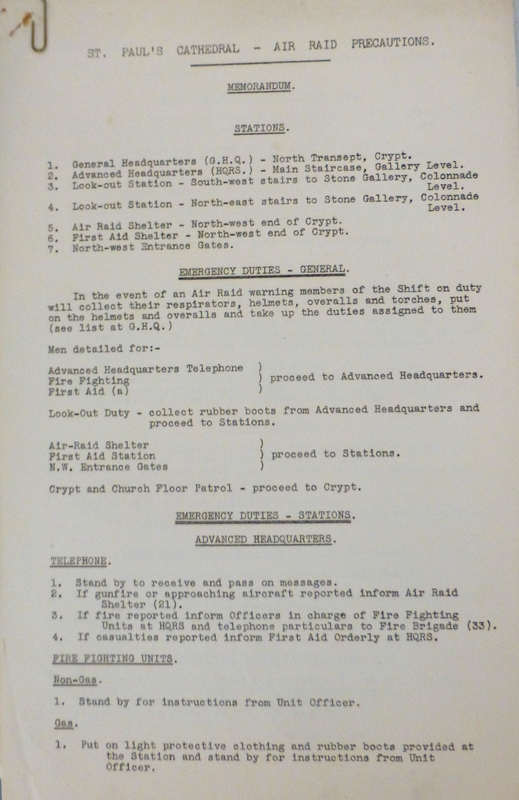 The appeal was successful as another 40 volunteers came forward, with the first full meeting held on the 15th September 1939 and from the 25th September a regular “night shift” from 9.30pm to 6.30am was maintained. Whilst the Watch was made up of volunteers, it was far from an amateur operation. 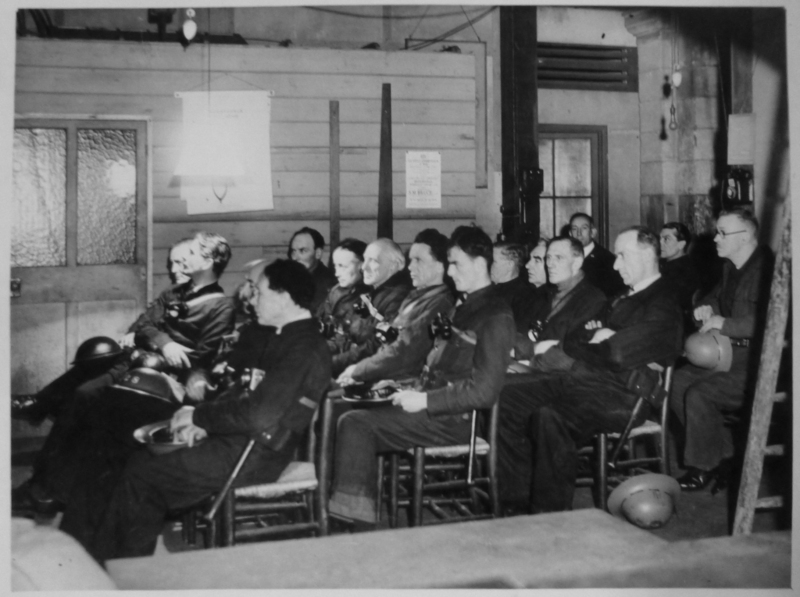 Under the guidance of Godfrey Allen the Cathedral was prepared and the members of the Watch participated in an extensive series of lectures, training and exercises to prepare them to work in the expected intense bombing to come. Many of the original lecture notes and training material remains in the archives at St. Paul’s. 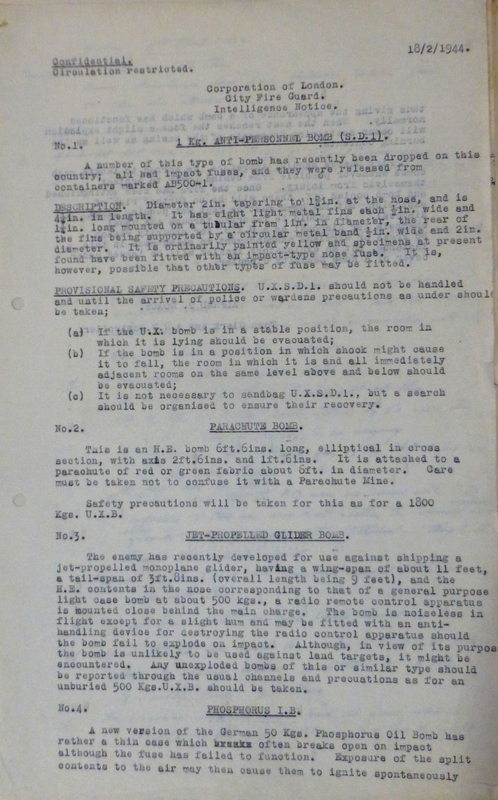 The following two pages are the initial Air Raid Precautions documented in November 1939. The level of planning and preparation is very clear and highlights what is needed to protect such a complex building as St. Paul’s. Note the reference to “gas proof area” and “gas curtains” in the following page. This was before any serious bombing had commenced and there was still an expectation that as well as explosive bombing, London would also be attacked with poisonous gas. Exercises included first hand experience of gas. A hut in Cripplegate was used to provide the experience of passing through a chamber filled with tear gas. Fortunately this was to be the only contact that London and the members of the Watch had with the much dreaded gas. The complexity of St. Paul’s, the numerous stairs, small corridors, access to roof spaces, access to the external roofs, access to the interior of the Dome etc. were a considerable challenge for those volunteering and without an in-depth knowledge of the building. Many sessions were held, training the members of the Watch to find their way around the Cathedral. Where to find equipment, water supplies, telephones etc. and to be prepared to do this whilst the Cathedral was in the dark, being bombed, on fire and with the constant threat of high explosive bombs. 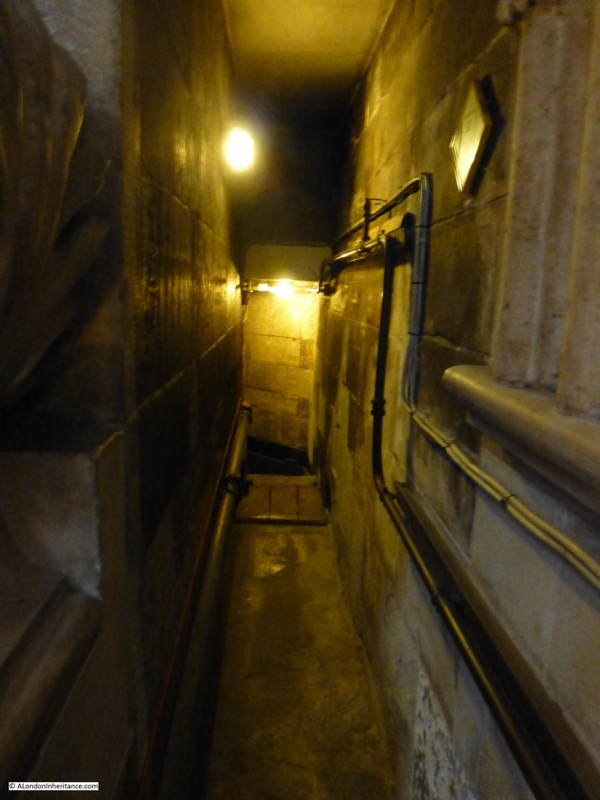 To give some idea of the types of small corridors that connect different parts of the upper building, the following are two photos that I took on the way to the Archive. 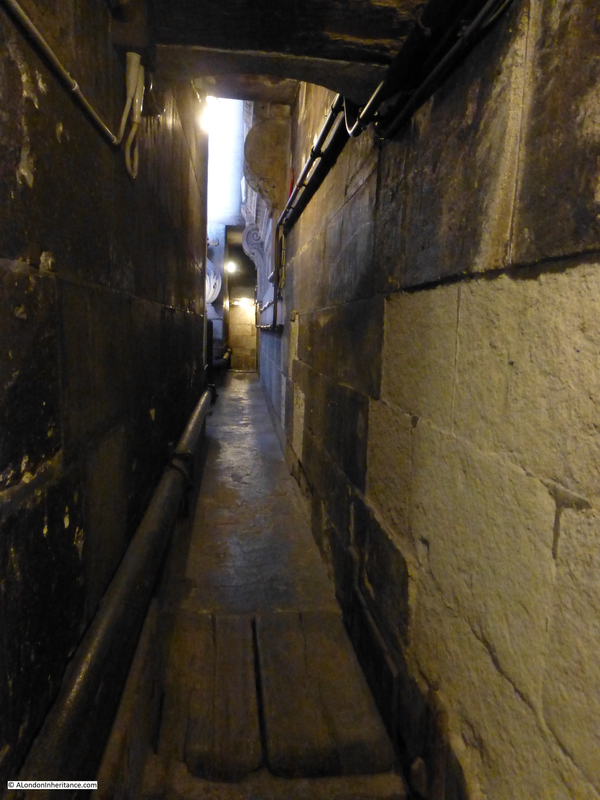 Adding to the challenge of trying to get to the site of a fire, the Watch would probably have to work through these corridors by torch-light whilst carrying tools and buckets of water. Remove the electric lighting, cabling and pipes and these corridors are probably unchanged since the time the Cathedral was originally built. There were a number of key factors to be considered when fighting a fire. Large quantities of water could do damage to the fabric of the building. There was a balance to be achieved with using the right approach to extinguish a fire without causing undue damage to what is an architecturally complex and delicate building. There was the issue of access to difficult locations. In a building as complex as St. Paul’s with many small, hidden locations, access to a large quantity of water was just not possible. And availability of large quantities of water was always a concern as would be demonstrated on the night of the 29th December 1940. Water would be required not just for St. Paul’s, but also to protect all the buildings in the City. Storage was a problem, the River Thames was tidal and bombing could also damage the pumps extracting water from the river and the complex pipes and hoses bringing water up from the river along the City streets. 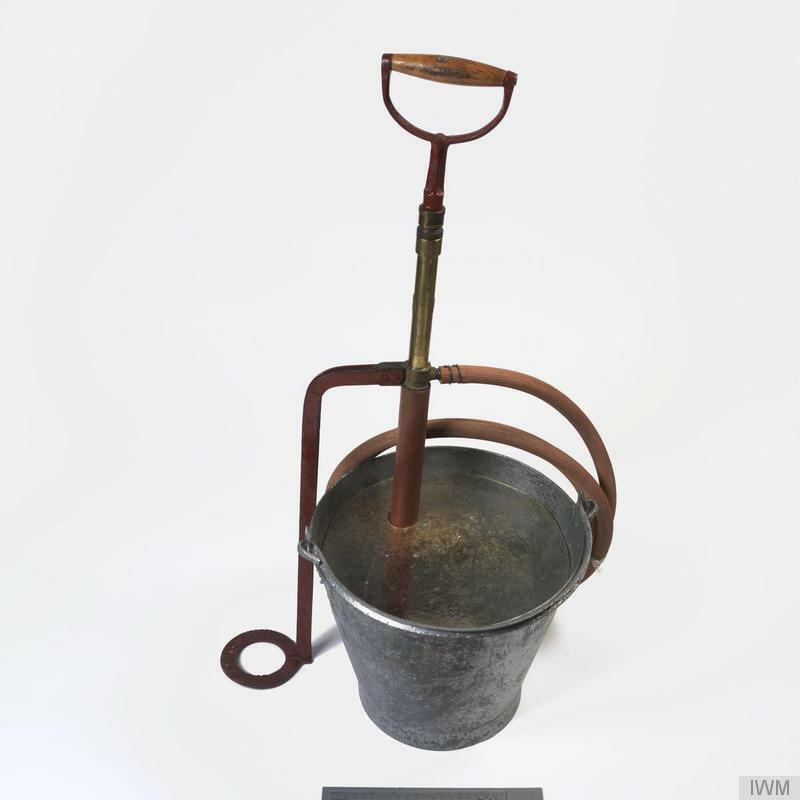 The Stirrup Pump was in such great demand as a fire fighting tool that at one stage, just a single factory in 1941 was producing 10,000 a week. As with all other areas of the Watch, there were detailed instruction and training in the use of the Stirrup Pump. As well as the Watch, St. Paul’s was also prepared for the possibility of direct bombing by the removal of all that was possible to remove and the protection of anything that could not be removed. 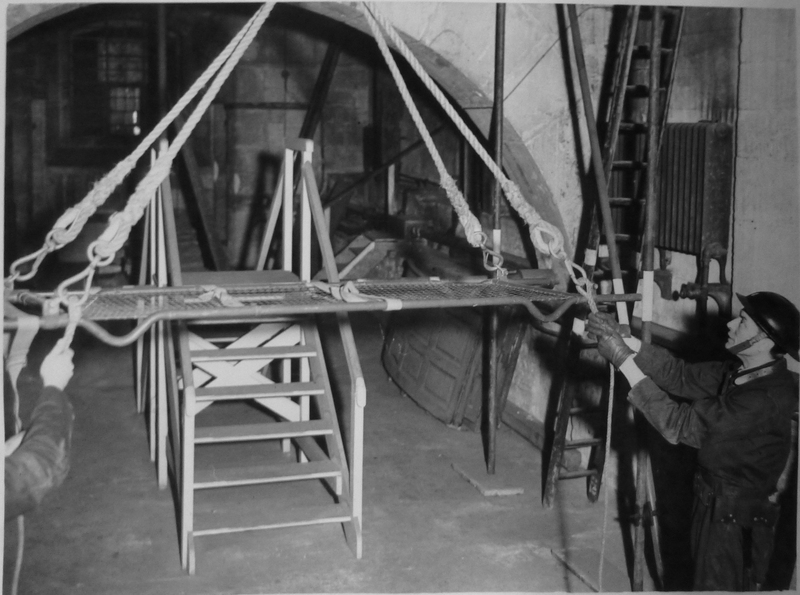 The Grinling Gibbons Choir Stalls were dismantled with the more valuable pieces being sent out of London, the rest being stored in the crypt. The ironwork gates by Tijou along with Wren’s model of the Cathedral were also sent out of London. The rarer books were sent from the Library to the National Library of Wales. Statues and busts which could be moved were relocated to the crypt. For anything that could not be moved, for example the memorial tablets to the Wren family, they were bricked in to provide some degree of protection. There are a number of photos in the Cathedral Archives that show the Watch. These appear mainly to be posed photos, possibly for newspapers and magazines, however they provide a very good record of the Watch and their working conditions. The following photo shows Stretcher Practice in the Dome galleries. In preparing for any bombing, there was a very real concern that the Watch could suffer injury. The Watch would not have waited until bombing has ceased to go out and fight fires, the Watch would have been across the roofs, in the Dome etc. looking out for damage, fighting fires and checking for incendiary bombs that had lodged in hidden parts of the Cathedral in the middle of raids. 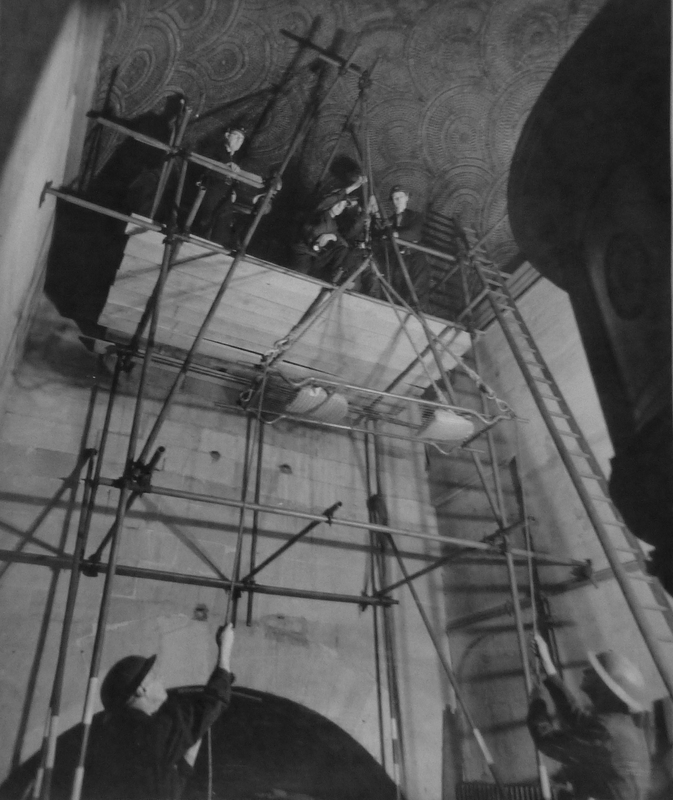 Bringing those injured down the long stairs from the upper reaches of the Cathedral was not considered practical, therefore arrangements were in place and tested to lower casualties on stretchers over the edge of the upper areas (for example the Whispering gallery) and lower them down to the ground floor of the Cathedral. I am not sure what would have been more frightening, the external threat from bombing, or being lowered in one of these from the great heights of the Cathedral. This rather puts the modern-day irritation of a delayed train on the way home in context. Locations were set-up around the Cathedral that could be used as waiting and reporting points and to control specific areas of the Cathedral. 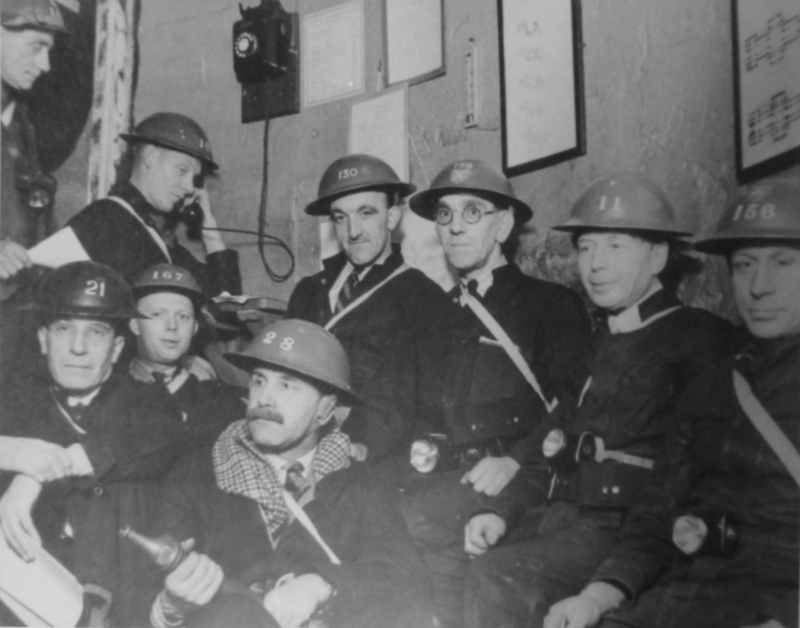 Each was equipped with a telephone to enable reporting back to the Control Station in the Crypt of the Cathedral. These photos also show the ages of the Watch. In 1939 conscription covered males of between 18 and 41 and by 1942 this has been extended to the age of 51. This would have limited the pool of men available to the Watch only to those over the age of conscription. The remainder of 1939 and the first half of 1940 was relatively quiet for the Watch. Training progressed, exercises were performed and the Cathedral was prepared as best as possible for what was still a threat that whilst imagined had not yet been experienced. “It was a golden, peaceful evening and, as the light faded from the sky, the angry red glow in the east, diversified by leaping flames, dominated the prospect, while from time to time the peculiar thud of bursting bombs punctured the silence. We were a silent company as we gazed upon the apocalyptic scene, each no doubt pondering many things. We noted, without remark the apparent absence of defence – an observation which we were to make often in the next few weeks. We wondered how long it would last before the attack moved westwards to the heart of London. We feared that the whole port of London was being annihilated. At last someone spoke, “It is like the end of the world,” and someone else replied, “It is the end of a world””. For the Watch training and preparation continued. Note the Watch members assigned medical tasks in the following photo with the cross on the white helmet. Axes and hoses were key components of equipment, however hoses were very dependent on having a readily available source of water under pressure. The availability of water was a constant issue for the Watch team. As would be found on the 29th December 1940, when water from the River Thames could not be relied on. Damage to pumps and pipes was always a risk, but also low tides in the river which took the main body of water below the level of the intake pipes. However in the event of mains supplies of water failing, these would be of little use. The Watch team prepared the Cathedral by storing supplies of water in all areas of the Cathedral using any form of container that could hold water. This would be invaluable in fighting the fires on the 29th December. The area to the immediate north of the Cathedral was destroyed in the raid of the 29th December. In the following months the buildings were cleared and water storage tanks installed. The outlines of these were still visible in the photos my father took from the Stone Gallery after the war. The following photo taken from the Cathedral shows the tanks in place, a couple of which can be seen in the lower right of the photo. Following the initial raids, the St. Paul’s Watch settled into a routine of periods when there would be intense activities, raids almost daily for a number of months, followed by periods of quiet, a time to regroup and repair damage. 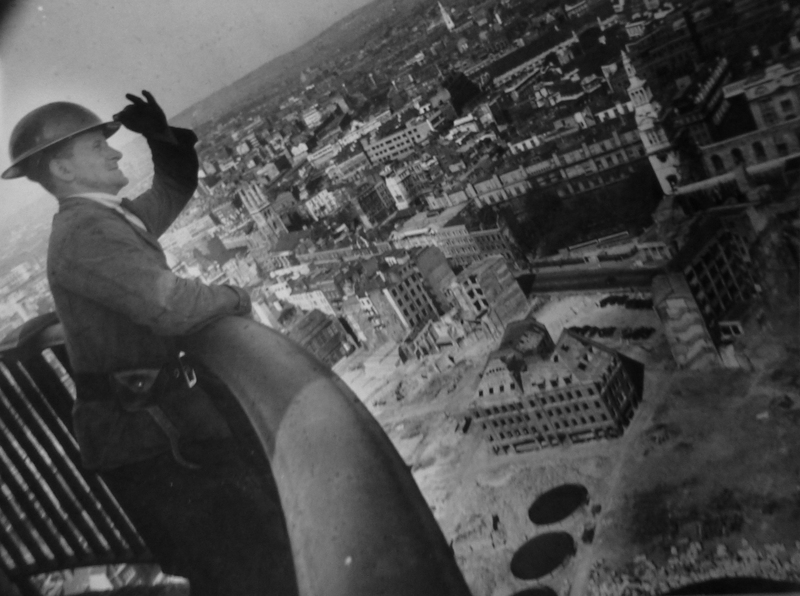 The Watch were critical in protecting the Cathedral from fire and the huge amount of incendiary bombs that fell on the City. The Cathedral suffered a few direct hits from high explosive bombs during the war. 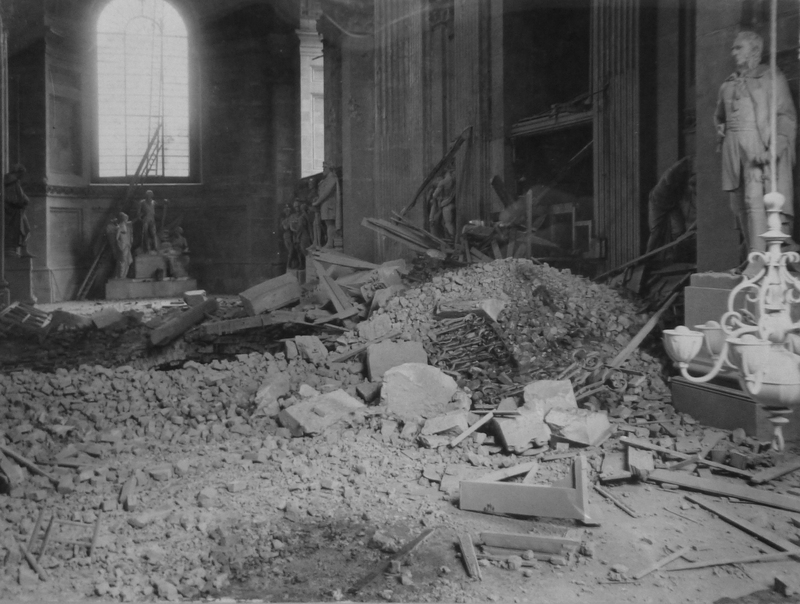 The following photo shows bomb damage in the North Transept caused by falling debris. The Cathedral had a very narrow escape on the 12th September 1940. The night had been one of intermittent attacks and in the early morning a high explosive bomb fell very close to the South West Tower. It narrowly missed the tower by a few feet and penetrated deeply below the road surface. The bomb did not explode, but due to the soft clay beneath the surface, the bomb gradually sunk deeper, eventually to reach a depth of 27 feet 6 inches below the surface. The bomb was removed on the 15th September and taken to Hackney Marshes where the bomb was blown up, it left a crater 100 feet in diameter. Had the bomb exploded on impact it would almost certainly have taken out the whole of the South West Tower and much of the West front of the Cathedral. There was very little that the Watch could do with an explosive bomb. If one hit the Cathedral it would explode on contact, any bomb that did not explode, either due to a fault or a delayed action fuse, was left to the professional bomb disposal teams. Emphasis for the Watch was always on the roofs of the Cathedral, the Dome and the risk of fire. The following memorandum from Godfrey Allen in September 1941 details the duties and procedures to be used in an emergency. 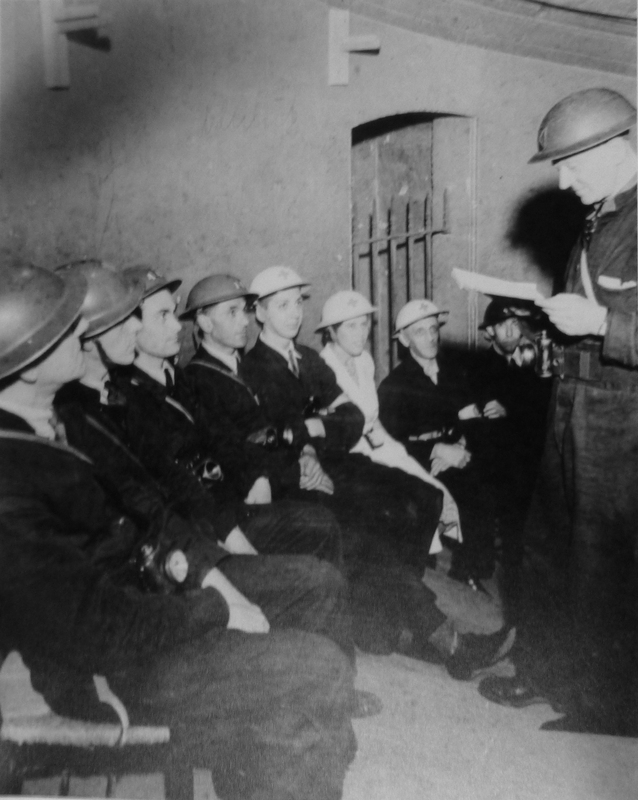 Training continued throughout the war, the types of threats continued to evolve and updates from the appropriate authorities provided the Watch with information on the threats they may have to face. 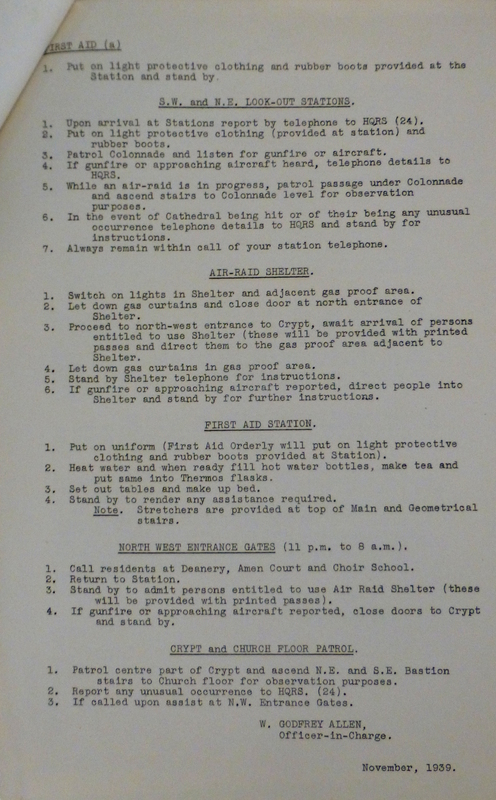 The following two pages are an Intelligence Notice from the Corporation of London detailing new models and versions of bombs. In researching the work of the Watch, one name keeps recurring, whether as the author of much of the training materials and instructions for how the Watch should operate, to the very limited number of books that have been written about the Watch. Godfrey Allen was the Surveyor of the Fabric before the War (he held the post from 1931 to 1956) and took on the command of the Watch for the duration. It was not only his intimate knowledge of the construction and layout of the Cathedral, but also his organisational abilities in moulding the Watch into the team that protected the Cathedral during the height of the blitz. He was also responsible for the immediate repairs needed to those parts where bomb damage had been suffered, both the immediate repairs to protect the building from the elements, but also the long-term repairs. Before the war, Godfrey Allen was also responsible for the St. Paul’s Heights policy. These were put together in the 1930s following the construction of The Faraday Building and Unilever House, which started to obstruct the views of St. Paul’s. The Heights Policy has remained in force ever since and is now part of the Local Development Framework of the City of London. 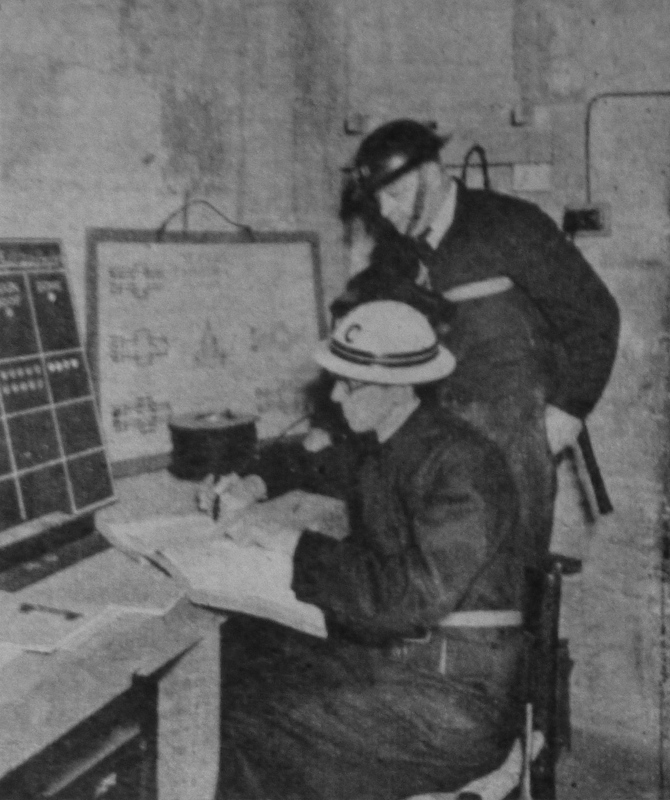 Mr Godfrey Allen (in the white hat) in the crypt control room. The Dean of St. Paul’s wrote at the end of the war “If any one man could claim to have saved St. Paul’s, that man is Mr Allen”. 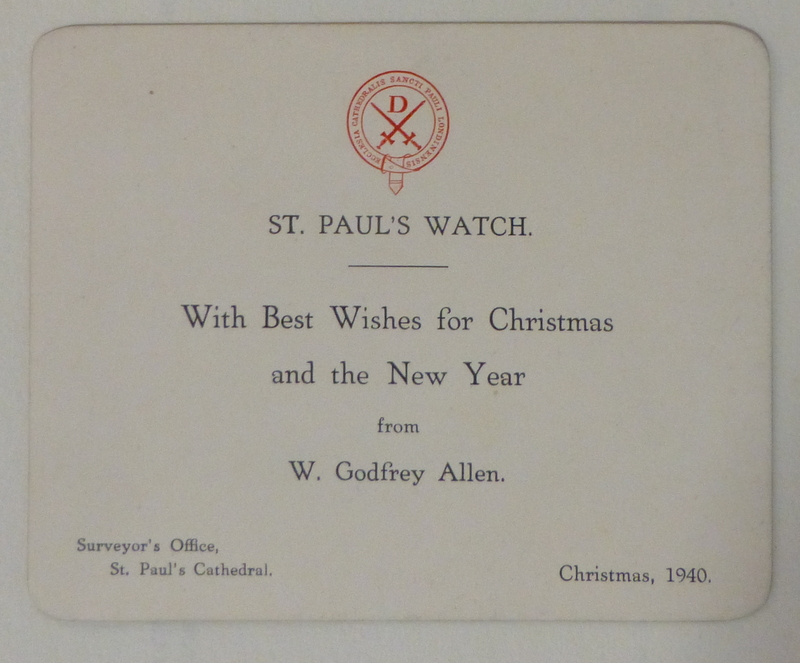 The Christmas and New Year card sent by Godfrey Allen to members of the Watch for Christmas 1940, during and continuing into the peak period of the London Blitz. The Watch continued until the very end of the war in Europe. 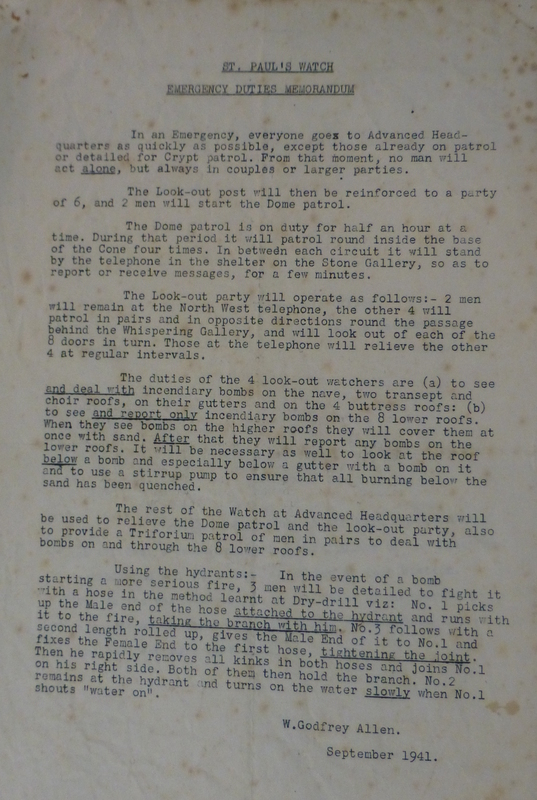 The “stand down” of the Watch was arranged and an act of worship planned for the final meeting of the Watch on the 8th May 1945. By coincidence, this was also the day that the German forces surrendered, VE day and the Cathedral was crowded all day long with frequent services held from early morning to dusk (an estimated minimum of 35,000 people attended the services during the day along with countless others who called into the Cathedral to mark the day’s events). The final meeting of the Watch took place at the end of the day’s public events. One of the closing paragraphs from Godfrey Allen’s reply to the Dean during the Service of Thanksgiving sums up what the members of the Watch must have felt at the end of such an intense period in their lives as well as in the history of St. Paul’s and London. 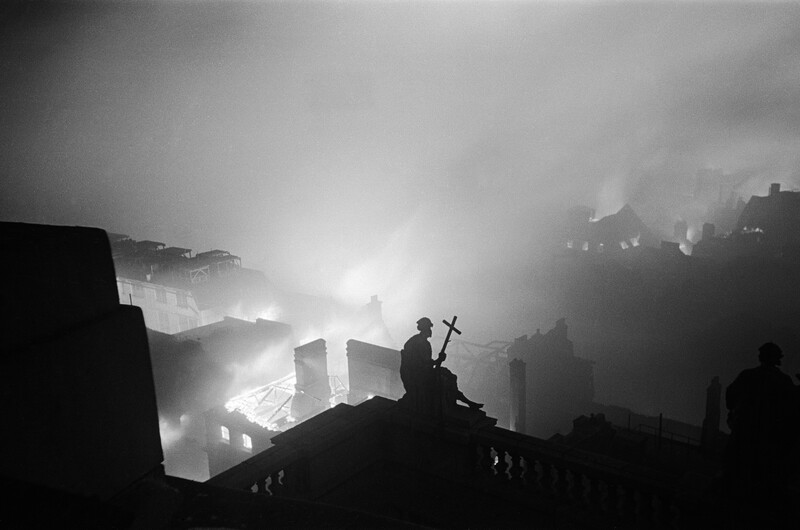 In tomorrow’s post I will cover the night of the 29th December 1940, the impact to the area around St. Paul’s Cathedral, and how the Watch protected the Cathedral from the surrounding devastation. This entry was posted in London Churches, The Bombed City and tagged St. Paul's Cathedral, St. Paul's Watch on January 3, 2015 by admin.